this is served like in a sizzling platter but you have to turn over the meat until it's cooked. i found the rice a bit coarse as compared to the rice in pepper lunch in japan. the rice here was kinda not chopsticks-friendly for someone like me who's not really adept to chopsticks. :( unlike in japan though, the pepper lunch here served your food with spoon and fork. fair enough. trina had to leave early since she had a company christmas party later in the evening. i was misled by shangrila's website. according to their site, pepper lunch is in level 6 but it turned out that it's in the basement, where shangrila's food court is located. as for being a high end mall, i hope they could keep their site up to date. not to mention their old-looking and slow elevators. pepper lunch here conforms to the usual cashier person kind of ordering. when in japan, you only have to press the buttons for whatever steak you like and your add-ons. oh well, this is the closest thing i can experience japan again. 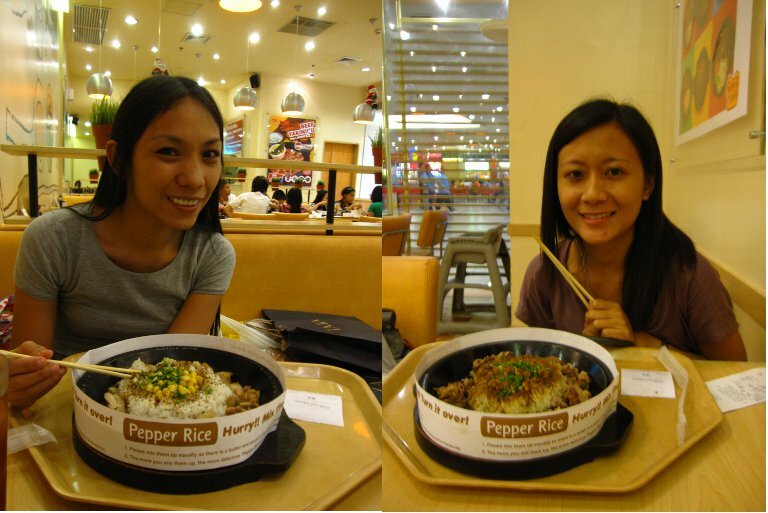 but comparing the pepper lunch here and sizzling pepper steak, i like sizzling pepper steak more. :-/ i'm referring to sizzling pepper steak in ayala, cebu.